There are many reasons to buy an iPad. Most of us need something we can use to browse the web, watch some Netflix, and play the occasional game of Angry Birds. So it’s pretty amazing to discover that there are a whole range of iPad-compatible toys that 10-year old me could never have imagined. From things that fly to things that roll and everything in between, there’s something cool for when you get sick of reading PDFs and looking at videos of cats and fails on YouTube. Here I’ve put together some of the iPad toys that have found their way onto my Christmas list (wink wink) and each one of them is cool in a different way. I’ve put my very favorite one at the top, but the rest aren’t ranked. Just different. So let’s get to the fun part. Here is my list of coolest iPad toys. Have you seen Star Wars: The Force Awakens? How awesome was that? The Force Awakens brings back that old-school Star Wars magic that got a little lost in the prequel movies, and understandably the world is very excited. Before the movie was even released it already produced a new star character. The rolling beachball droid BB-8. This guy (who was originally a girl) is one of the most adorable little rust buckets to ever grace our screens. I bet even R2D2 is feeling a little nervous. 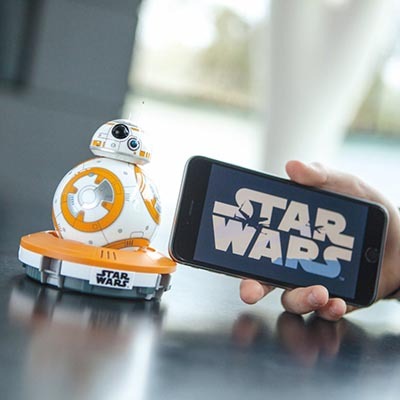 It wasn’t long until people started asking for a toy and Sphero, which already had a rolling ball toy, stepped up to the plate and made one of the most faithful BB-8 toys to date. Using your iPad (or other mobile device, but who cares) you can manually control BB-8 or you can put him into a patrol mode. He’ll also respond to your voice and has AR holographic videos you can see on the iPad screen. This thing is packed with features. One of the coolest things is that Sphero is still updating the app and features. Lately they’ve added a function to the BB-8 where he will watch The Force Awakens with you and react to all the scenes appropriately. My favorite part is when he just sits in his charging cradle and looks around. For some reason that’s just awesome. Do yourself a favor and check out the video. You’ll be convinced in no time. Not every iPad toy accessory is purely about having fun. Some of them, like the Osmo Gaming System, aim to teach you stuff too. The actual accessory is pretty simple, yet very clever. There’s a special stand for the tablet and then a sort of plastic periscope thing that goes over the front camera so that it looks down on the surface in front of the tablet. Here you can take part in all sorts of educational and creative games. There are four base games, two of which require additional physical pieces that come with the game. You can also buy additional games and even create your own. I like the creativity that went into designing this system. 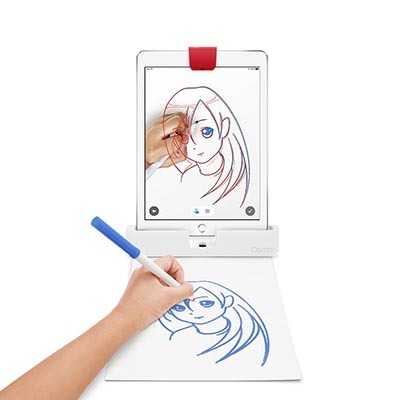 Just by adding two plastic parts and some smart software, players can work together, draw pictures, and interact with the software in a completely new way other than just by using the touchscreen. 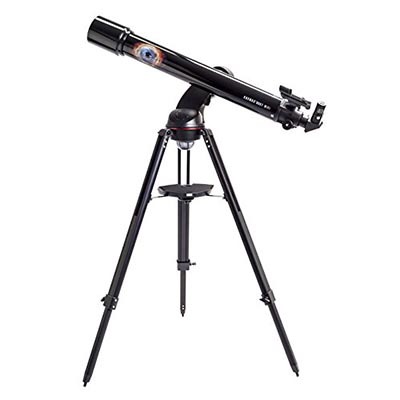 Space may be the final frontier according to the people from Star Trek, but for now if you want to explore the stars then this Celestron Telescope is probably a more sensible way than astronaut school. This particular model is actually a special edition associated with the new Cosmos program hosted by astrophysicist Neil DeGrasse Tyson. Which, if you are a fan (and who isn’t? ), is a pretty neat bonus. Celestron says that this is the first WiFi controlled telescope and uses the COSMOS Celestron Navigator App on iPad to control the scope. It’s not cheap, but this is definitely one of the coolest things you can pair with an iPad, for sure. The app has a database of more than 100 000 celestial object and you can center the view simply by tapping on any one of them. The app is self contained and does not need an internet connection, with all the information built in. It uses GPS location data to let you know what you can look at on that night. Apparently you can see craters on the Moon and the rings of Saturn. Awesome is literally the right word. The AR Drone has a reputation that precedes it. Not only is it one of the most famous iPad associated toys, it is also responsible to a great extent for the popularity of drones for regular Joes and Janes. 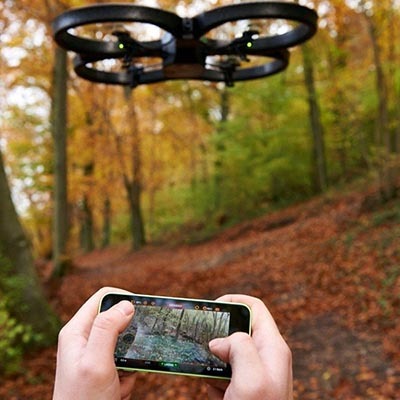 Before app-controlled flying machines like you needed to be a skilled RC pilot, but with the Parrot drone you just need to tap and tilt your iPad to steer this cool flier; using the built-in camera to see the world from a new angle. It is still one of the most affordable ways to get into the world of drones and it certainly is one of the coolest iPad toys ever created. Although it is now definitely seriously outclassed by newer equipment that can be used for professional purposes, the AR drone holds its own as something a bit better than a toy, but still within reach of casual fun seekers. 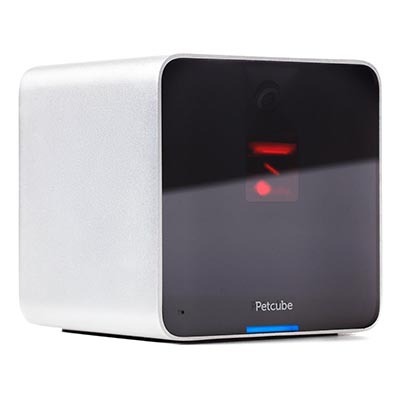 Is the Petcube a toy? Well, yes, but maybe not for human beings. This is a WiFi camera that you can access and control using your iPad. Not only can you check if everything is still OK at home, you can speak to and play with your pets using the built in laser pointer. I can actually think of far more uses for the Petcube than just messing with my cats. You could use it to keep an eye on your employees while you are on holiday. Bark orders at them through the speaker and point out things for them to do using the laser pointer. Sure, they’ll probably throw your $200 toy in the toilet bowl, but it will have been totally worth it. This drone from Parrot doesn’t fly, but it rolls and jumps. Something that’s definitely a bit different from other “drones” on the market. So if you are a bit nervous about a flying camera toy this could be a great alternative. Now, there have been other wheeled camera toys, such as the Rover 2.0 spy tank, but the Parrot’s party trick is its ability to jump 2.5 feet in the air and always land on its feet. The app that controls it is known as FreeFlight 3, and since this is a non-flying drone you don’t even need FAA registration – I thought this would be obvious, but clearly Parrot felt the need to make a point of this. I guess enough people asked about it, and now I have lost just a little bit of faith in humanity. The other advantage this toy has over its flying brethren is the battery life. It will run for 20 minutes and only needs an hour to recharge. 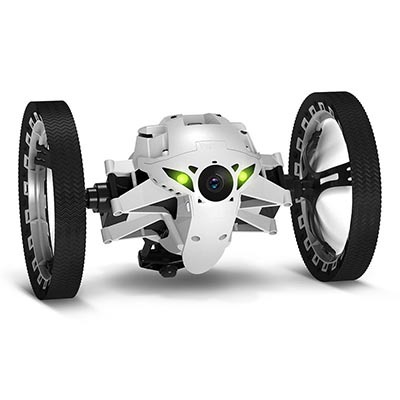 The battery is removable and interchangeable with the Parrot Mini Spider, which I have also looked at on this page. You can also program sequences of tricks and moves into it which really makes this a great little toy, in my opinion. The camera streams a wide angle feed directly to your tablet. The top speed of this toy is s blistering two meters per second, if you choose the less stable high speed mode which shortens the wheelbase transformers-style. I can’t really find any specs on the camera though, but as you can see from this sample footage you aren’t going to be making a movie with this little guy. Still, it’s a cool little toy and a great way to do some low-level office spying. Over the years WowWee has made some of the coolest robot toys for non-rich people. The original Robosapien, for example, was a mind-blowing machine when it first came to market; coming off as much more sophisticated than it actually was. The age of iPads and iPhones have only made WowWee’s stuff better, and this new version of their RoboRaptor is a good example of this. I used to have a RoboSapien that worked only with a gamepad-like IR remote; trying to learn all of the key combinations to get him to do stuff was a real pain. Basically, you had to keep a cheat sheet on hand in order to get the most use out of a cool, but expensive, toy. 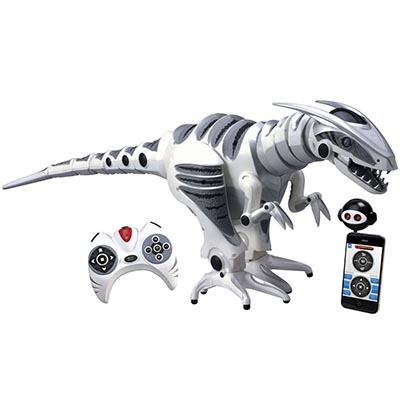 In this case there is still a remote so you can do things old-school, but by using the app you can easily activate all the noises and tricks the Roboraptor X has under the hood. The Skylanders figure-based games have taken gaming consoles by storm. Now even our iPads are not safe from these little guys. Skylanders is what’s known as a “toys-to-life” game. By using the little (sold separately) Skylander figures you can insert them into the game. This starter kit includes a wireless controller, two figures, and the portal you use to activate the characters for use in the game. 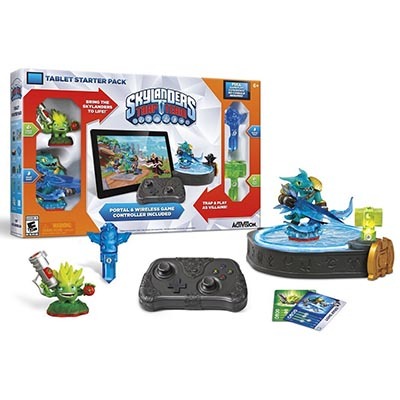 The main reason I am so impressed with this toy is that it brings the console experience of Skylanders Trap Team almost unscathed to the iPad. Sure the graphics are a little downgraded, but I doubt that the little terrors we call children will be too worried. If you are an adult fan of Skylanders (and why not?) it’s a pretty sweet deal too. Just be prepared for the wallet-crushing figure collection addition that is also included. I have spent a lot of time over the years playing Guitar Hero instead of actually, you know, practicing to play my actual guitar. This is a game that really makes you feel like a rock star even though you’re just mashing some colored buttons to a prompt. Now the game has been freed from its console and PC shackles and has found its way to the iPad. You get the cool plastic guitar as part of the deal and now you too can rock out in your hotel room as the cleaning staff awkwardly walk in the door. 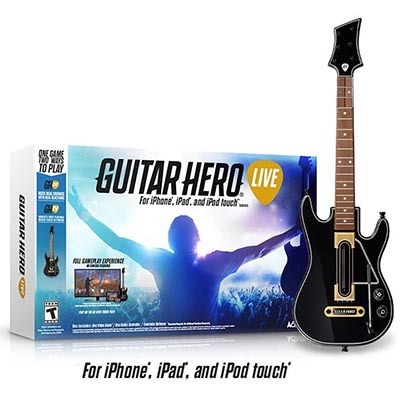 Guitar Hero Live is not your old Playstation 2 game though. They have really mixed things up and now the look and feel of the game really evokes the emotion of live performances. Gone are the cartoony graphics and in is real footage taken with awesome camera rigs, so you can feel that you’re really jamming on stage with some of the greats. Given how weedy tablet speakers are, you may want to invest in some nice Bluetooth headphones, though. From the very big to now the very small, this is the Mustcam Digital Microscope. This is so very CSI and I love the idea of a wireless digital microscope. It is battery powered and will run for 100 minutes off a charge. You can hold it in your hand or attach it to the included stage for more precise imaging. It also works with PC and Android, but hey, this is an iPad site so forget I even mentioned it. You can get up to 200x magnification on this puppy and that makes it perfect for all sorts of professional applications and hobbies. Paired with an iPad it makes a pretty neat field microscope as well. You can go out and capture images away from a desk or lab, bringing back video or photo imagery that would not be possible with a traditional microscope. It has built-in LED lights too, so you don’t have to worry about lighting the stage. Just be warned that it can only manage fps at 720p, and 1280×720 is in fact the maximum still footage. The price is pretty reasonable, though, and the cool factor is right there. It also supports iOS versions as old as 5.1, so maybe an old iPad can be permanently paired with this. I bet many of you thought that your iPad was good for nothing more than watching YouTube and losing at Words with Friends, but as you can see there are a lot of cool, weird, and wonderful things your iPad can do with a little accessorizing.